All in all a stunning entry into a new market, using Korg's studio frontline, battle-tested technology. Converts on the fly. Audiogate pairing is extremely effective. Sounds fantastic. Korg breaks into the audiophile market with the DS-DAC-100 using the high-end DSD technology it implemented on its hardware MR recorders to deliver a superior sound for real hi-fi connoisseurs. 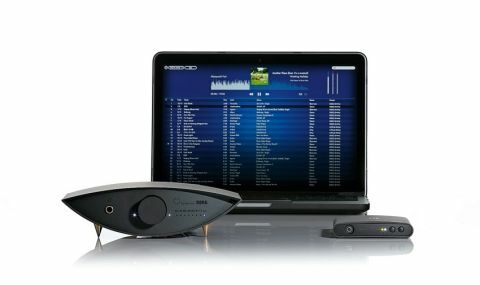 There are two units in the range, the 100 (pictured bottom left) and 100m (right) and each audio interface front ends to Korg's Audiogate 3 software. The main difference is the serious XLRs on the 100 (reviewed here), compared to the 3.5mm headphone and stereo line-out on the 100m. "The real boon is the system's ability to do the conversion on the fly, creating and outputting a DSD file that you never have to store or see"
The 100 sits on spiked metal feet to reduce vibration and metallic felt-bottomed boots are conveniently supplied to protect surfaces. Meanwhile the single USB connection provides power - no off-board power supply luxury here - and both feature LEDs indicating playback resolution. Back in Audiogate 3 your digital files, WAVs, FLAC, AIFF (or even MP3) can be converted to high-end DSD and stored - a process akin to ripping your CDs all over again. However, the real boon is the system's ability to do the conversion on the fly, creating and outputting a DSD file that you never have to store or see. Open your FLAC or WAV in Audiogate 3 and it converts as it plays, interpolating missing data to fill the gaps up to the peerless DSD format. So what does it sound like? It sounds fantastic. We compared it to a much pricier Beresford system and it sounded different, but just as good. Audiogate presents more to listen to and we got the feeling it was extracting more information from FLAC than we'd previously heard. And when the software is teamed with a DAC designed to work specifically with it, your confidence (and enjoyment) increases in the knowledge that both parts of the chain are delivering at peak performance. All in all a stunning entry into a new market, using Korg's studio frontline, battle-tested technology. And the price shines a bright light on the smoke and mirrors of pricier DAC systems.